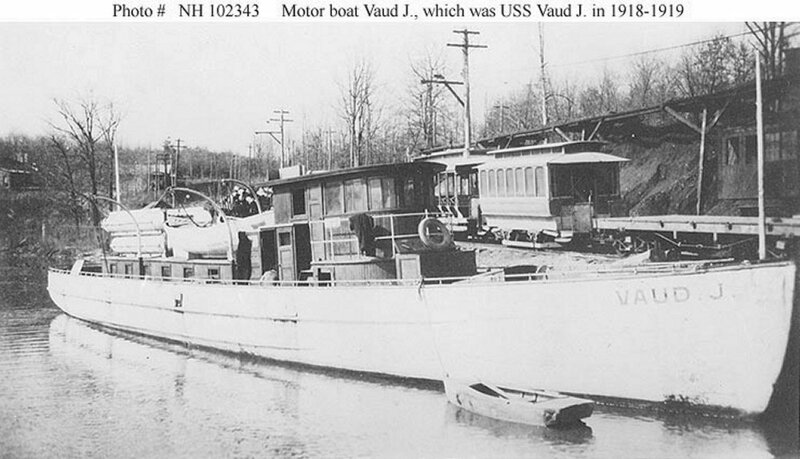 Motor Launch: Built in 1907 by Thomas Johnson, Wildwood, NJ; Acquired by the Navy 17 September 1918; Never commissioned; Struck from the Navy list and sold 30 June 1919 to the Chesapeake Water Supply Co. of Norfolk, VA; Sold in 1924 to Hurley Booye of Cape May, NJ; Sold in 1930 to Harry Mogok of Cape May. Fate unknown. Specifications: Displacement 63 t.; Length 101'; Beam 19' 8"; Draft 4' 6"; Speed 8.6 kts. ; Complement eight; Armament none. 123k Photographed prior to World War I, with interurban railroad cars behind her.